Slide 3: Building Vocabulary Knowledge: Students can use a paper dictionary or the two online dictionaries that are linked into the speaker notes of this slide to define the words: citizen, campaign, political, constitution, democracy & federal. Slide 4: Paragraph about Presidents' Day: Students highlight the important information using the highlighter tool. 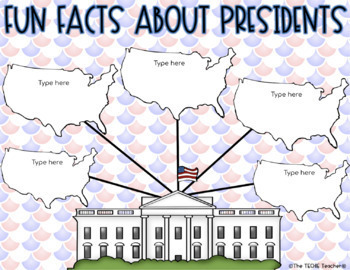 Slide 5: Embedded YouTube video about Who Can Become President: After viewing the video, students type their answers in the right hand side of the table. After answers have been added the the table, students will use the magic reveal magnifying glass to uncover the correct answers that are hidden in the answer key that appears to the right of the slide. 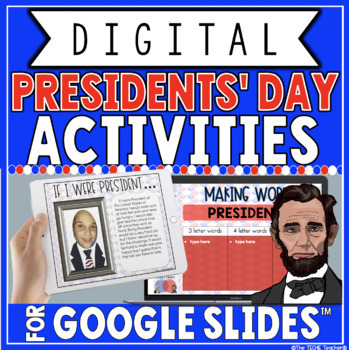 Slide 6: Fun Facts About Presidents: Students will visit the three different kid friendly websites that are hyperlinked in the speaker notes to research facts about Presidents. They will then type their 5 favorite facts using the text boxes provided inside the outline of the US maps. Slide 8: If I Were President: Students will take a selfie and crop to shape (directions are linked into the speaker notes) to place as the head in the President portrait. They will then type a paragraph about what they would do if they were the President of the United States. Slide 9: Acrostic Poem: Students will type an acrostic poem using the word AMERICA. 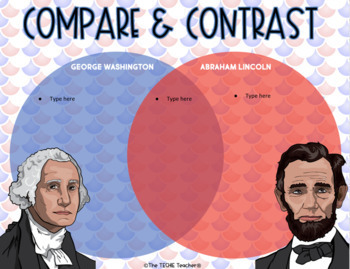 Slide 10: Compare & Contrast: Students will type facts in the Venn Diagram that compares/contrasts George Washington and Abraham Lincoln. Research links are provided in the speaker notes. 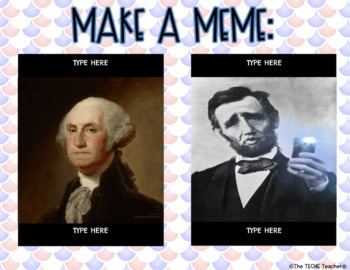 Slide 11: Make a Meme: Students can add text to the animated memes of George Washington and Abraham Lincoln (George rolls his eyes while Abe takes a selfie). Slide 13: Try It! (Extra) This slide mentions and links to the 1600 AR app for mobile devices that will allow the user to scan George Washington in any dollar bill. The White House will pop up and students can take a look around 1600 Pennsylvania Avenue. It is really neat! You could download the free app as a class or just have students try it at home if they are interested. All slides contain student directions in the speaker notes. This resource can be used on Chromebooks, laptops/computers and iPads.